Social Forum Journey » Propaganda for or against capitalism? Propaganda for or against capitalism? 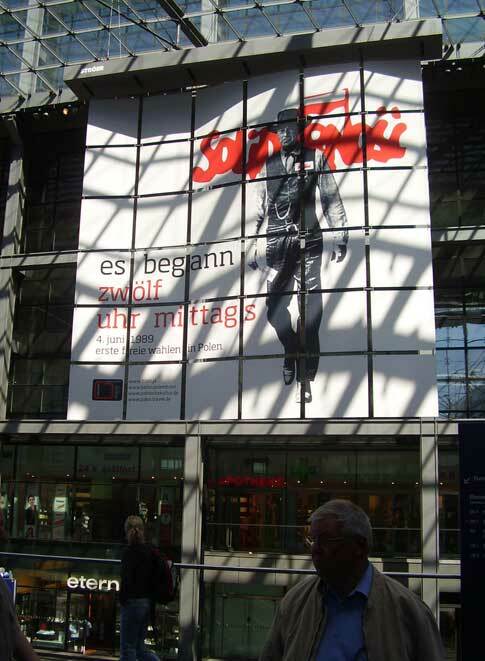 In Berlin at the main railway station there was a huge banner showing how the kitchen revolution in Central and Eastern Europe was carried out in 1989. What happened was that a tuff US sheriff arrived making people courageous at High Noon. That is how Solidarinosc and the other movements started and fulfilled their role in changing society in Poland and other countries. 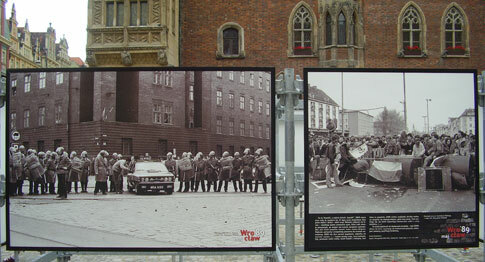 In Wroclaw there was also pictures presenting how the change took place. 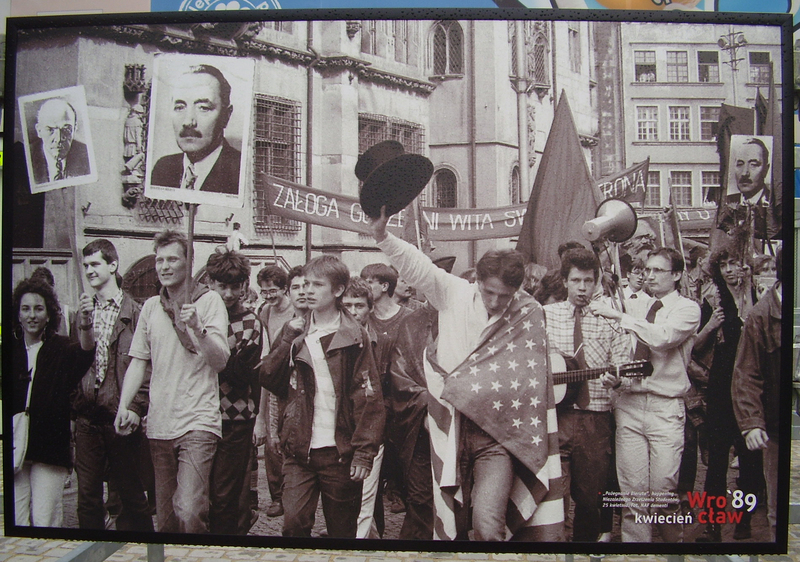 At the central square poster with pictures from the year 1989 was set up, here with Lech Walesa, the leader of the trade union Solidarity. 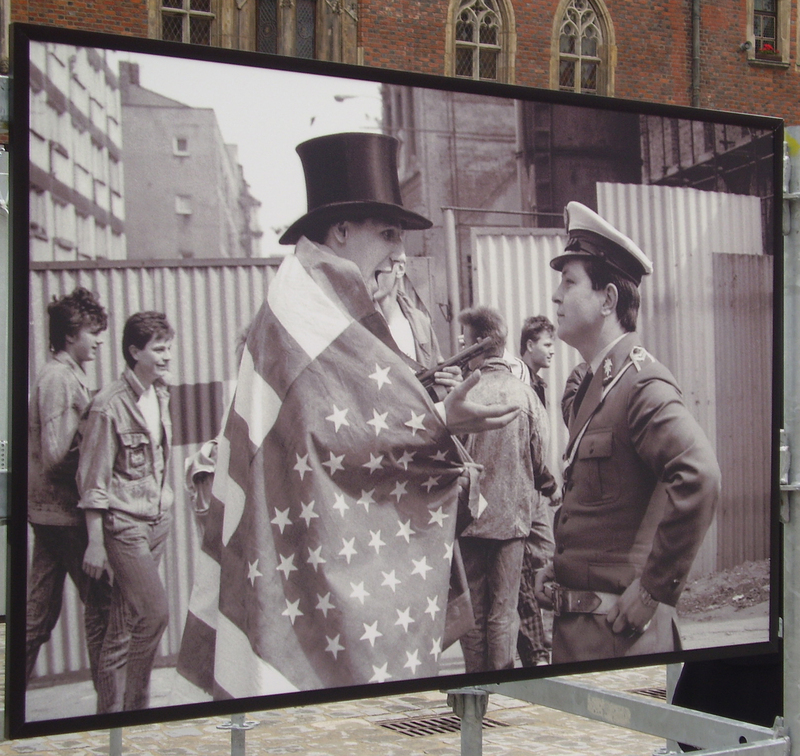 Here we can see that the way the change in Poland was presented in Berlin was true. The US is an ideal for those that dare to confront the police. But what is this? Lenin together with the US flag. And what is this? That mustache looks very typically polish and whatever the women have in her hand, it is not a pistol. And this looks somehow familiar, riot police to the left and black block to the right. In full mood for fighting and even prepared behind barricades, one with a mask. Maybe the bandit that the US sheriff must arrest? Certainly this as well looks familiar. To have children to bring forward a political message is a favorite among all regimes. Stalin loved to be photographed with children and many movements have used children in the forefront of their protests. One of the most successful was Barnetogene, the Norwegian national liberation movement against Swedish imperialism that organised special children marches in the late 19th centrury that still today every 17th of May are very popular. So it seems they were in Poland. Here is one more familiar scene. Green federation and others are protesting against radioactive risks if I understand the message correctly. This is certainly any European environmental protest in the 1980s. My experience from traveling in these days and visiting the illegal or half illegal environmental movement is that they took an active part in overthrowing the communist regimes … and the first one at least in Poland to take action against the new government to stop nuclear power. The peace movement was also active of course also looking more like modern European popular movement activists than US sheriffs. And what to say? How to win the kitchen revolution, so labelled after the places it was organised. By pistols or flowers? The dominant explenation in the West is that it was the US sheriff and his armament that forced the change to take place. The people on these pictures were of no importance nor all other Europeans that struggled for peace in the world on both sides of the split between the so called East and West, for the envrionment, human rights and social justice. What matters is the pistol not the flower. But somewhere there might grow new flowers. Once upon a time the propaganda resurces of the countries ruled by communist parties in CEE countries was immense. Here is the view of the Karl Marx Allé in Berlin from the Alexander Platz tower. Today the resources for making communist party propaganda is meagre. 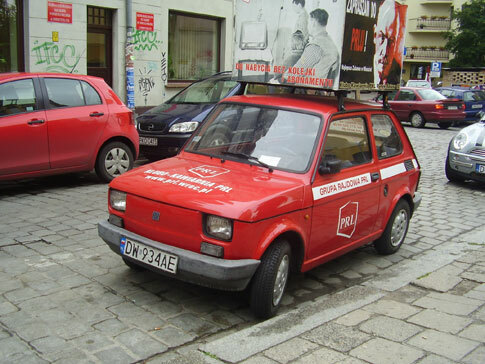 Here is the Communist party propaganda machine in Wroclaw.